Psidium. (From psidion, Greek name for Pomergranate.) 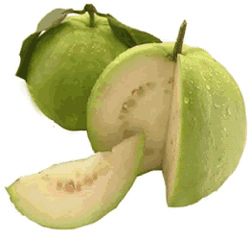 GUAVA. Myrtaceae. About 100 species of evergreen trees or shrubs. Leaves opposite, simple, pinnately veined. Flowers usually large, white, calyx tube prolonged above the ovary, splitting irregularly at flowering time; petals 5; stamens many. Fruit a globose or pear-shaped berry, sometimes large and edible. Americas. Closely related to Feijoa and Acca. Z10. Psidium guajava and Psidium littorale are widely grown in tropical and subtropical zones for their fruits. They are notable for their tolerance of a range of soil and environmental conditions, thriving in the humid lowland tropics to cooler altitudes of 1500m, and in areas of low to medium rainfall although for good fruiting, they require at least 1000mm of rain per year, with a dry period for fruit ripening. Psidium littorale tolerates short-lived light frosts and prefers a drier climate, and makes attractive hedging in warm temperate regions. In cool temperate zones, given slightly higher glasshouse temperatures (minimum 7-10ºC), cultivation is as for Feijoa. Both Psidium guajava and Psidium littorale are amenable to training as espaliers or goblet-shaped standards in pots, the spring and mid-summer flowers giving rise to ripe fruit within about 3-4 months under favourable conditions. Shrub or small tree to 8m. Branchlets 4-angled. Leaves to 7cm, glossy above, pubescent beneath. Flowers 2.5cm diameter, solitary. Fruit to 6cm, sulphur-yellow, with white flesh. C America. 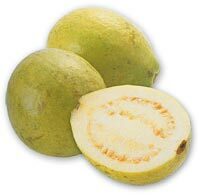 COMMON GUAVA; YELLOW GUAVA; APPLE GUAVA. Shrub or small tree, to 10m. Bark scaly, green-brown, branchlets 4-angled. Leaves to 15cm, ovate to oblong-elliptic, pubescent underneath, veins prominent. Flowers white, solitary or few together on slender peduncles. Fruit ovoid to pear-shaped, 2-10cm, with yellow or dark pink flesh. Tropical America; cultivated throughout the tropics and subtropics and frequently naturalised. 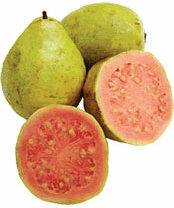 Fruit varies in size, shape, colour and flavour and has a musky penetrationg odour. ‘Beaumont’: pink-fleshed. ‘Detwiler’: yellow-fleshed. ‘Pear’: flesh cream-white. GUAVA. Shrub or small tree to 7m. Branchlets nearly cylindrical. Leaves to 13cm or more, ovate to oblong-elliptic, rusty-pubescent beneath. Flowers white, solitary or a few together on slender peduncles, fragrant. Fruit ovoid, brown-green, turning to pale yellow when ripe, slightly acid. Tropical America. Fruit smaller than the common guava; too bitter or resinous to be palatable. Shrub or small tree to 8m. Bark smooth, grey-brown. Leaves to 7.5cm, elliptic to obovate, glabrous. Flowers white, solitary, to 2.5cm in diameter. Fruit to 4cm with white flesh. Brasil. variety littorale. YELLOW STRAWBERRY GUAVA; YELLOW CATTLEY GUAVA; WAIAWI. A rather loosely branched small tree. Fruit sulphur-yellow, somewhat translucent, acid when ripe. variety longipes PURPLE GUAVA; PURPLE-STRAWBERRY GUAVA; CATTLEY GUAVA. Small, dense tree. Fruit globose, purple-red, sweet when ripe. ‘John Riley’: fruit large, dark red. MOUNTAIN GUAVA; SPICE GUAVA. Shrub to about 2m with flat rounded branchlets. Leaves ovate to oval, rounded at both ends or cordate at base, stalk short or absent, veins obscure. Flowers white; peduncles 1-flowered to few-flowered. W Indies.